Centennial Field in Burlington, Vermont, was created to satisfy a need for better athletic facilities for the University of Vermont, which was founded in 1791, the year Vermont was admitted to the union. In the late 19th century, University sport teams played at Athletic Park located on Riverside Avenue and North Prospect streets. This site proved problematic for two reasons; one, it was too far from campus, which was located on University Place in-between Colchester Avenue and Main Street, and secondly, it lacked a fence, which prevented teams from charging admission to games. By the turn of the century, the University was looking for a new site for its athletic fields. The problem was resolved on August 30, 1903, when the University purchased seven acres of land from Mrs. Grace Ainsworth, who owned a sixty acre farm along Colchester Avenue. In the summer of 1904, after the passing of Mrs. Ainsworth, the University purchased the farm in its entirety and designated the land Centennial Field, in honor of the centennial anniversary of its first graduating class celebrated that year. (Mrs. Ainsworth has since "watched over" the development of her farm as she was laid to rest in the adjoining Green Mount Cemetery). Beginning that same year and continuing into the next, Professor Arthur D. Butterfield of the Universityís Engineering Department, surveyed the grading of the land and the plotting of the field, track, and bleachers. This would mark the beginning of Centennial Field's period of historic significance. On April 17, 1906, a long tradition of baseball at Centennial Field was launched when the University of Vermont defeated the University of Maine, 10 -- 4, in the first baseball game played at the new ballpark. The popularity of baseball at the University of Vermont at the turn of the century reflected the sport's popularity nationwide. Having evolved out of stick and ball games played by early colonists, baseball began to take the form and rules that we know today by the mid-19th century. Civil War soldiers avidly played baseball in their military encampments, and following the declaration of peace there was a baseball boom in America. Baseball clubs were formed on college campuses throughout the United States. In 1870, Harvard Universityís club embarked on a forty-three day, twenty-five game tour that extended as far as St. Louis. At the same time, the country's top seven to eight clubs were totaling approximately $100,000 in admission receipts. The sport continued to grow and took on professional status. By the turn of the century there were two professional leagues -- the National League and the American League. By the late 19th century, this baseball frenzy reached Vermont where, at the University, it was considered the most popular sport on campus. In 1913, Centennial Field was confronted with a problem that occurred in ballparks throughout the country -- its wood bleachers burned to the ground. These were replaced with other temporary wood bleachers, however, their status as "temporary" is a misnomer as they lasted for nearly a decade. An answer to the fire problem was found in 1922, with the construction of a fireproof, steel and concrete grandstand. Based on a design by Levering & Garigues, Co., an engineering firm from New York City, the new grandstand would wrap around home plate from third to first base and would consist of three sections; a roofed center section with adjoining exposed wings. As with the popularity of the sport at the University, the construction of this grandstand reflected a growing national trend. Beginning in 1908, ballpark construction in the United States underwent a transformation. Many of the earlier wood grandstands that were lost to fire were replaced by larger steel and concrete structures. These more permanent stadiums created a sense of continuity that further solidified baseball's position as our national game. On the major league level, these parks included Forbes Field in Pittsburgh built in 1909, and Shibe Park in Philadelphia, the first steel and concrete stadium, also constructed in 1909. Although many steel and concrete ballparks were constructed during the period 1909 -- 1930, few remain, and those that do have been largely altered. The years spanning 1936 --1950 were the most prosperous for Centennial Field. While continuing to serve as home to the Universityís team, Centennial also played host to semi-pro baseball, which flourished in Vermont and upper New York states with the establishment of the Northern League. On a national level, the popularity of baseball rose and fell with the economy. As the Depression gave way to a wartime economy, the popularity of baseball increased with greater employment, higher wages, and gasoline rationing that kept people closer to home. The quality of baseball in the Northern League was of a caliber such that many of the players went on to play on a higher level including the major leagues. A few of those who played at Centennial Field and later graduated to the majors were Vermont natives, including Ralph Lapointe of Winooski who later played for the Philadelphia Phillies and St. Louis Cardinals. During the period that the Northern League flourished, baseball at Centennial was literally a Burlington institution. When the population of Burlington was approximately 26,000 inhabitants, attendance ranged from 1,000 to 3,000 per game during the Northern League season with a total of 57,000 people watching games at Centennial in 1938 over a 30-plus game season. The numbers, however, began to wane in the late 1940s with an increasing number of competing recreational activities, and, especially, with increased proliferation of the automobile and television. The dissolution of the Northern League coupled with the discontinuation of baseball as a varsity sport at the University of Vermont in the late 1960s, ushered in a period of decline in the interest in baseball, and, subsequently, a period of deterioration for Centennial Field. This was reversed in the 1970s when UVM reinstated its varsity baseball program and, even more significantly, in the 1980s when minor league professional baseball came to Vermont bringing back crowds in the thousands and reaffirming Centennial Field's position as a Burlington institution. In order to bring professional baseball to Vermont, minor league team owners lease the ballpark from the University during the summer months. In the 1980s, Centennial Field played host to Double A affiliates of the Cincinnati Reds, and, later, the Seattle Mariners. After a brief hiatus in the early 1990s, minor league professional baseball came back to Vermont in the form of the Single A, Vermont Expos, an affiliate of the Montreal Expos. This team is currently thriving and consistently drawing large crowds. The list of players enshrined in baseball's Hall of Fame who played or coached at Centennial during the Northern League era from 1936 -- 1950, or, who visited during exhibition games includes: Tris Speaker, who came with the visiting Red Sox in 1910; Connie Mack, who coached the visiting Athletics in 1938; and Robin Roberts, who played for Montpelier in the Northern League and visited Centennial in the late 1940s. Other notable major league players who came to Centennial for exhibition games include: Smokey Joe Wood and Harry Hooper from the 1910 Red Sox team; Vic Wertz, Vern Stephens, and Jimmy Piersall who were brought to Centennial in 1948 by Burlington native Birdie Tebbetts who played for the Detroit Tigers, Boston Red Sox, and Cleveland Indians; and George Foster and Bill Lee who came in 1992 playing on Lee's humorously named Grey Sox team. With the introduction of minor league baseball, the list of great players who called Centennial their home field continues to grow and includes such notable stars as Ken Griffey, Jr., Barry Larkin, and Omar Vizquel. Centennial Field's grandstand is currently honored with the distinction of being the oldest complete grandstand structure in use in minor league baseball. This distinction though, should be qualified in two ways to avoid misrepresentation. First, Centennial's minor league baseball history is a relatively recent development. It has played host to Double A teams (Reds and Mariners) and Single A teams (Expos) only since 1984, and entirely lacked a minor league team during the years 1989-1993. 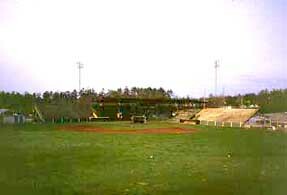 Secondly, other minor league parks such as St. Cloud Commons in Huntington, West Virginia, have sections of their grandstands dating before the construction of Centennial, yet these have later been largely altered, thereby giving Centennial's complete grandstand structure this distinction. While the subject provides fodder for argument, as people will invariably strive for the "oldest" designation and the distinction it brings, the significance of Centennial has to do with the retention of its historic integrity. The fact that Centennial, unlike many of its contemporaries, has remained virtually unaltered gives it a distinction unique in itself. As it continues to play host to college and professional baseball, Centennial Field retains integrity of location, design, materials, and feeling, and remains a focal point in its community. This is an excerpt from a nomination to the National Register of Historic Places that was researched and written by Michael McQuillen '00, as part of his course work in the University of Vermont Historic Preservation Program in 1999.